Academy Award winners Kathy Bates and Jessica Tandy star with Mary Stuart Masterson and Mary-Louise Parker in this inspiring drama adapted from Fannie Flagg's best-selling novel. When an unhappy housewife (Bates) befriends a lady in a nursing home (Tandy), she hears a remarkable tale of laughter, devotion and a special friendship that defies all obstacles in this heartwarming film from acclaimed director Jon Avnet. 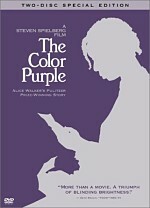 The Anniversary Edition features an extended cut of the film. For years, 1991’s Fried Green Tomatoes has resided high on my list of most-hated movies. I saw it theatrically back then and absolutely loathed it. Smug, condescending, narrow-minded and man-bashing, I found it to be an insufferable piece of work. So why am I watching it again now? Because I’ve not revisited it since the early Nineties and I’m truly curious to discover if I’ll view it differently now. I’ve certainly changed a lot over the last 15 years – will any of that affect how I interpret Tomatoes? The film introduces us to tubby, mousy housewife Evelyn Couch (Kathy Bates). When she and her husband Ed (Gailard Sartain) go to visit his elderly aunt in a nursing home, the old biddy chases out Evelyn. With nothing better to do, she takes a seat and immediately finds herself in a conversation with old Ninny Threadgoode (Jessica Tandy). At first she just seems like a doddering, rambling victim of senility, but as she draws Evelyn into the chat, she delights in her stories of her youth. We flashback to the past to meet tomboyish Idgie Threadgoode (Nancy Atchison) and her brother Buddy (Chris O’Donnell). We see his crush on Ruth Jamison (Mary-Louise Parker) and the way those three bond. This ends in tragedy, though, when Buddy dies in a railroad accident. The story ends there, as Evelyn and Ed need to leave the nursing home. We then see the state of their marriage. Evelyn attends a class to learn how to renew the spark in their relationship, but her efforts don’t succeed. Ed appears happy with the status quo, as he prefers his comfy life of beer, baseball, and a doting wife. Evelyn re-encounters Ninny and finds herself caught up in another tale of the old days. The rest of the movie shows additional chats between Ninny and Evelyn, most of which revolve around stories about Ruth and adult Idgie (Mary Stuart Masterson). The main one involves Frank Bennett (Nick Searcy), Ruth’s husband and the man Idgie gets accused of murdering. We also see how these tales affect and empower Evelyn in the present day and alter her relationship with Ed. Here I am, 15 years older and potentially wiser. The big question: did I find any pleasures in Tomatoes that escaped me in 1991? The big answer: not a one. If anything, the movie may well have irritated and disgusted me more now than it did then. There’s not an emotion found in this film that it doesn’t telegraph well in advance and then use to beat us into submission. Subtle this film ain’t. From its insanely obvious depiction of Idgie’s Alternate Sexuality to its portrayal of the characters to the way it shows its scenarios, everything comes across as obvious and without any finesse. The movie never gives us a chance to think for ourselves or view things in our own way. It prefers to shove its thoughts down our throats and pound us with its narrow views of good and bad. And it does so really poorly, as its efforts consistently backfire. Let’s start with Idgie. We’re supposed to see her as a free-thinking rebel who doesn’t subscribe to society’s arbitrary rules. Instead, however, she comes across as rude, selfish and obnoxious. There’s not a single element of charm or likability in the character, and Masterson’s aggressive performance doesn’t help. She fails to bring out anything even remotely warm in the role, as she makes the character consistently irritating and unable to view anything from any perspective other than her own. Of course, the movie wants us to see her as its most stellar personality. When she opens a restaurant, she practices integration, and the film makes her Alternate Sexuality patently obvious from minute one. Tomatoes doesn’t make out her unstated but blatant homosexuality to be just another option; it clearly touts it as the way to go in a world populated with cold, uncaring men. I have absolutely no objections to homosexuality at all, but I don’t want to see a film in which it’s made out to somehow be better than heterosexuality. I don’t see either as inherently superior to the other, so don’t beat me over the head with an agenda. Heck, the flick even posits Idgie as some wonderful Robin Hood kind of character. Early on, she and Ruth hop a train and Idgie throws food to the poor who live along the tracks. Of course, she steals this grub, but who cares? She’s helping the less fortunate – that means it’s okay to do whatever you want, right? Blech! The movie’s dreadful dialogue doesn’t help. Where is this world in which everyone speaks in faux meaningful stories? I don’t just mean Ninny’s tales, as they’re a crucial element of the plot. I refer to the way in which no one just talks; they always tell us fables with lessons to be learned. These start as cloying and go downhill from there. Continued problems come from the film’s tone. Its overriding theme: men bad, women good. Sure, the flick offers a few exceptions to the former, as it tosses out some innocuous decent guys like Symbolic Slave “Big George”. However, its two main male characters – Ed and Frank – are either simply inconsiderate or blatantly evil. Frank may well be the most simplistically portrayed character in the history of cinema. The flick never gives us any sign about why Ruth married him. Instead, it paints him as pure nastiness. He beats her from the relationship’s start and even makes him a member of the KKK! All of this exists to decrease the film’s already low layer of complexity and make Frank’s eventual murder seem all the more justified. Violent, cruel and heartless, he exists as a symbol of the Men Bad theme and nothing else. Unfortunately, this attitude taints Ed, who doesn’t deserve it. Of course, he never abuses Evelyn in physical ways, but the flick views him as almost as negative as Frank. Okay, that’s an overstatement, especially since the movie loses sight of Ed during its second half. Essentially it posits him as the root of Evelyn’s problems and then ignores him other than as an obstacle to her self-awareness. Not for a second does the film give Ed a sympathetic portrait, as he stands as an emblem of all the selfish, uncaring men out there. I won’t go out of my way to defend Ed, though I think the story ignores Evelyn’s role in making him who he is. Her root problem isn’t Ed – it’s her lack of self-esteem. 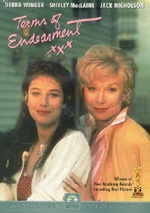 The movie nods in that direction at times, but it focuses more on Ed’s flaws than Evelyn’s. This doesn’t seem right to me. Again, I don’t see Ed as a great husband, but I also fail to view him as an ogre. He takes Evelyn for granted but he’s not a bad guy. He certainly doesn’t deserve the antagonism Evelyn throws his way as the movie progresses. Ah, Evelyn, otherwise known as “Plot Device”. At the film’s start, it presents her as a pushover too eager to please everyone and without any backbone. As the flick progresses, her meetings with Ninny empower her and turn her into an aggressive Amazon woman. We’re supposed to see this as progress, but I can’t view it that way, largely due to the extreme behavior exhibited by the character. Take the movie’s famous trailer moment. In this scene, some obnoxious younger women take a parking place for which Evelyn waited. When she protests, they taunt her and say they’re “younger and faster”. Evelyn’s response? She batters their Bug and tells them she’s older and has more insurance. I recognize this is intended as a movie fantasy moment, but it strikes me as an absurd message nonetheless. Is it really progress for someone to turn to idiotic acts of violence as a solution to problems? Never mind the stupidity of Evelyn’s comment about her insurance. How will insurance matter in a crash intentionally caused by one party? The movie tries to convince us that Evelyn claimed it was an accident, but that’s stupid beyond belief. Essentially Evelyn goes from being too nice to being too nasty. Couldn’t the character find some middle ground? But in a flick that considers the selfish Idgie to be self-realized, I guess that’s the path Evelyn must take. The movie paints its emotions in patently obvious ways. When Idgie throws the stolen food to the masses, the event comes along with sweeping, noble music and shots of an adorable, appreciative tyke. It even toys with us in regard to Ninny’s real identity. It’s always really obvious who she actually is, though the movie doesn’t deign to reveal this “secret” until the end. If you don’t get it, I’ll give you a clue: doesn’t it seem odd that none of Ninny’s stories mention herself? Oh, I need to stop there or my blood pressure will skyrocket. Suffice it to say that Fried Green Tomatoes remains as insufferable in 2006 as it did in 1991. This is abysmal pseudo-feminist tripe with no redeeming qualities. Note that this DVD features an “Extended Version” of Fried Green Tomatoes. This adds about seven minutes to the theatrical cut’s 130-minute running time. Because I’d not seen the film in 15 years, I didn’t identify the changes myself, but director Avnet mentions some of them in his commentary. He tells of an added sequence in which Evelyn puts makeup on Ninny, and we also see a little of Idgie and Big George after the appearance of the KKK. The shot of Ruth in church is new, as is the portion with Ninny and Evelyn at the gospel church. We also get a brief bit in which Sipsey tells two boys not to eat the “special” barbecue, and there’s a piece with Ruth and Idgie as they chat in front of the café. Whether these added sequences help or hinder the movie should probably be left up to viewers who don’t loathe the film like I do. 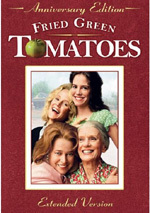 Fried Green Tomatoes appears in an aspect ratio of approximately 1.85:1 on this single-sided, double-layered DVD; the image has been enhanced for 16X9 televisions. The transfer narrowly fell short of greatness as it consistently satisfied. The main minor concern related to some light edge enhancement. This added a slight layer of softness to some wide shots. Most of the movie offered very solid delineation and clarity, though. I noticed no signs of jagged edges or shimmering, and source flaws were virtually absent. The movie looked a bit grainier than expected, but otherwise I saw no print concerns. Colors appeared positive. 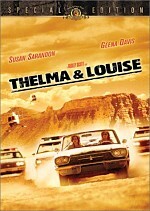 The movie usually went with a fairly warm, nostalgic palette, especially in the flashback stories. This didn’t present a tremendous level of stylization, though, and fit with the flick well. The modern scenes showed more vivid hues, which made sense. The tones were consistently strong, as were black levels. Shadows came across as clear and easily visible, though the dark-skinned actors occasionally got lost in the shuffle. Nonetheless, this was a positive transfer with no significant issues. Should one expect much from the Dolby Digital 5.1 soundtrack for a 15-year-old character drama? Of course not, but the mix was perfectly satisfying for a flick like this. The soundfield usually focused on the forward channels, where it opened up matters reasonably well. In addition to solid stereo music, most of the movie presented general ambience, as only a couple of elements like trains broadened matters to any degree. Surround usage remained minor. The back speakers added minor reinforcement of the music and effects but featured nothing noteworthy. This remained fine with me, as the scope of the mix suited the material. No issues with audio quality occurred. Speech was natural and concise, while effects displayed good reproduction. Except for perhaps those train shots, the elements never pushed the mix, but they seemed accurate and clean. Music was full and lush throughout the film. As I mentioned at the start, this wasn’t a film that needed a rock-‘em sock-‘em soundtrack, but the audio we found here was more than acceptable. A moderately extensive set of supplements opens with an audio commentary from director Jon Avnet. He provides a running, screen-specific chat. An exceedingly screen-specific discussion, as a matter of fact, and that creates problems. Avnet does manage to cover a good mix of subjects. He talks about the cast and their performances, issues related to the adaptation of the original work, visual design and weather, historical areas, sets and locations, and various specifics of the shoot. Avnet touches on the issues one would expect for him to discuss. Unfortunately, he chats about these only in relation to what he watches on the screen. The commentary never takes a “big picture” viewpoint, so what Avnet sees is what we get. This makes the commentary plodding and considerably less involving than it should have been. Four Deleted Scenes fill a mere one minute, 17 seconds. The first shows Evelyn as she sees a pile of laundry she mistakes for a dead Ninny, while the next two show Big George and Idgie at the hospital after Buddy Junior’s accident. The last one lets us see that pair again at Buddy’s high school graduation. Fans will be happy to see these, but all are very minor. In the two minutes and 45 seconds of Outtakes, we get a basic blooper reel. Something more substantial comes with the documentary called The Moments of Discovery: The Making of Fried Green Tomatoes. This 65-minute and 39-second program presents movie clips, behind the scenes images, and interviews. We find remarks from Avnet, associate producer Lisa Lindstrom, MCA Motion Pictures chairman Tom Pollock, writer Fannie Flagg, producer Jordan Kerner, composer Thomas Newman, bee specialist Dr. Norman Gary, and actors Kathy Bates, Stan Shaw, Cicely Tyson, Jessica Tandy, Mary Stuart Masterson, Mary-Louise Parker, Chris O’Donnell, and Gary Basaraba. Created in 1998, the program looks at the project’s development and adaptation, characters and story, casting and performances, sets and locations. We also hear about the movie’s use of food, shooting specific scenes, music, costumes, the heat and other natural complications on location, and the film’s themes. While “Moments” covers many areas already addressed in Avnet’s commentary, it adds perspective and presents a more complete package. The program also brings us some nice views from the set. I especially like the tour of the café and the other location elements. The other participants bring their own views as well, and those help expand our understanding of the production. “Moments” offers a solid examination of the movie’s creation. Text comes next, first with Sipsey’s Recipes. These teach us how to make buttermilk biscuits, skillet cornbread, coconut cream pie, pecan pie, fried chicken, chicken and dumplings, fried ham with red-eye gravy, grits, fried catfish, milk gravy, pork chops and gravy, snap beans, black-eyed peas, creamed corn, lima beans and butter beans, candied yams, fried okra, turnip and collard greens, fried green tomatoes, and fried green tomatoes with milk gravy. Wow – that’s a surprisingly large number of recipes. I have no idea if they’re good, but this is a fun extra. Jon Avnet’s Director’s Notes gives us an annotated look at the script. We see text for three scenes with comments added by Avnet in regard to shot planning. These cover “The Death of Buddy”, “The Bee Tree”, and “The Food Fight”. This area offers a good way to check out his thoughts. More stills appear in the next two domains. 164 Production Photographs cover cast, crew, sets and food, while Poster Campaign offers 29 images. The photos are moderately interesting at best, but I like the posters. I think most of them weren’t used, so it’s fun to see the different ideas. Broad and overdone, Fried Green Tomatoes remains one of the most insufferable films I’ve ever seen. It takes serious topics and boils them down to simplistic notions of good and bad. Essentially women are wonderful, men are evil, and that’s that. The flick never becomes richer or more fulfilling than that, and its transparency makes it an aggravating experience. But at least it gets good treatment on DVD! This edition offers solid picture and audio as well as a pretty nice roster of extras. If Tomatoes appeals to you, grab this good disc. I still think it’s one of the worst movies ever made, though.